This is a fairly new footpath that starts from off Ramper Road (left turn from the A620 from Beckingham to Retford). From the footpath sign, just over half way down Ramper Road, cross the road and go over the stile and down the side of the old Crown Inn (now residential house). The path goes the length of the property and under a brick archway (that appears to be part of a single garage) to a stile at the end. Once over the stile the path goes across the field and you can see the main Beckingham to Gainsborough Road in the distance. 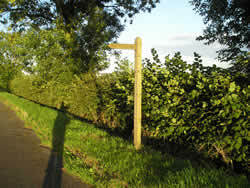 The footpath goes out of the field in the bottom corner and onto a path of its own which leads you to the main road. Once at the main road turn left and you are just a few hundred yards from the Beckingham roundabout that takes you back into the village.